を得る。しかし、 は整数なので、 と の間に整数が存在することになってしまい矛盾が生じる。 Q.E.D. が成り立つ。 の一般項から は正かつ単調増加なので、複合は共に となる。 Q.E.D. In Marseille, our amazement was total when our HP-67s*16, calculating *17 on the one hand from the definition above and on the other hand by the recurrence (2)*18, kept on producing the same values! 個人的には, Kontsevich-Zagierの予想は, そこに予想としてあってくれるだけで幸せな予想, 解けなくてもよいが, その予想を心の中で唱え, それが予言する世界に思いを馳せるだけで幸せになり, 自分でも何かやりたいという冒険心を書き立てられる予想である. "where do these identities come from?" "They grow in my garden." 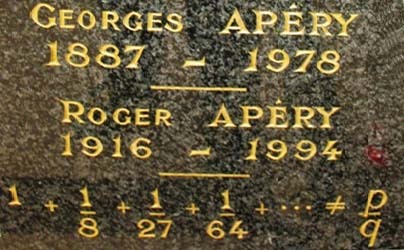 [A] R. Apéry, Irrationalité de et , Astérisque 61 (1979), 11–13. [B] F. Beukers, A note on the irrationality of and , Bull. London Math. Soc. 11 (1979), 268–272. [C] H. Cohen, Démonstration de l’irrationalité de , (d’après R. Apery), Séminaire de théorie des nombres de Grenoble Vol. 6, (1977-1978), 1-9. [KZ] M. Kontsevich, D. Zagier, Periods, Mathematics unlimited-2001 and beyond, Springer, Berlin (2001), 771-808. [P] A van der Poorten, A proof that Euler missed ..., The Mathematical Intelligencer 1 (4) (1979), 195-203. [E] E. Reyssat, Irrationalité de selon, ApérySéminaire Delange-Pisot-Poitou. Théorie des nombres, Vol. 20, Issue: 1, (1978-1979), 1-6.